Nanmu (Phoebe zhennan S. Lee) is a well-known rare tree species in China that is valued as an ornamental garden plant and for its high timber quality. Recently, the cultivation of nanmu has gained attention for use in tree resource conservation and ecological restoration projects. Drought is a major environmental factor that affects the growth and development of plants. In this study, the drought tolerance and post-drought recovery of nanmu, which is associated with antioxidative enzymes and osmotic adjustment, were examined by exposing nanmu saplings to drought for 30 days followed by 10 days of re-watering in a greenhouse. Drought stress resulted in increased levels of osmolytes, sugars and proteins in nanmu leaves compared with the well-watered controls as well as higher concentrations of superoxide radicals and hydrogen peroxide, leading to lipid peroxidation and significantly higher activities of superoxide dismutase, catalase and guaiacol peroxidase and higher levels of ascorbic acid. After re-watering for 5 days, most of the antioxidant enzymes and ascorbic acid were restored to their original levels, whereas the activity of guaiacol peroxidase and the levels of soluble sugar and soluble protein remained markedly high. 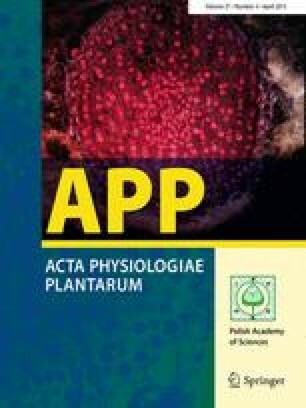 Moreover, nanmu saplings maintained normal turgor pressure under mild and moderate drought conditions, indicating the presence of a mechanism that affects osmotic adjustment and growth restriction, thus enabling the plant to adjust to drought stress. These results suggested that an antioxidant defence system and osmolytes play important roles in nanmu during drought stress and recovery. We thank the National Support Program (2011BAC09B05) and the Sichuan Province Crop Breeding Project (2011NZ0098-10) for funding this project.